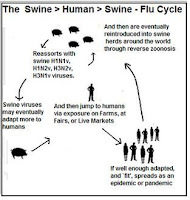 While avian flu viruses have garnered the bulk of the media's interest over the past few years, swine variant viruses (H1N1v, H1N2v, H3N2v) are also consider a potential source of pandemic viruses, and in 2009 we saw exactly that when a swine-origin H1N1 virus jumped to humans. The subtypes of flu viruses that commonly spread in swine (H1, H2 & H3) are also the same subtypes that have caused all of the known human pandemics going back 130 years (see Are Influenza Pandemic Viruses Members Of An Exclusive Club? ), and are generally regarded as having less far to `jump’ to than many avian viruses. Although human infections with swine-origin viruses are only rarely reported (only 5 in the United States in 2015), in 2012 the United States saw more than 300 cases, possibly the result of the acquisition of the M gene from the 2009 H1N1 virus, which may have enhanced its transmissibility. Surveillance is problematic, however, since few with mild to moderate flu symptoms are ever tested, even in the United States. In other countries, the odds of detecting human swine flu cases are pretty remote, although in countries monitoring for avian flu (China & Egypt mostly), the odds are a little better. A 2013 study (see CID Journal: Estimates Of Human Infection From H3N2v (Jul 2011-Apr 2012) estimated that in the United States - for every case detected - 200 may have gone undetected. So human infection is likely far more common than we know. Last December, in PNAS: The Pandemic Potential Of Eurasian Avian-like H1N1 (EAH1N1) Swine Influenza, we looked at a study by Chinese and Japanese researchers who had isolated and characterized a number of avian-like H1N1 virus variants circulating in Chinese pigs that they believe have considerable pandemic potential. Although more than half of the viruses sampled in the PNAS report fell into the EAH1N1 lineage, there are a number of other swine H1N1 variants circulating in China as well. 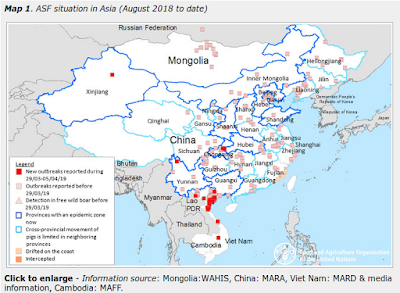 All of which brings us to the latest WHO Influenza at the Human-Animal Interface summary (dated Feb 25th, but only released in the past 24 hours), which includes this entry on three Chinese swine variant virus infections going back to the middle of 2015. Three human infections with A(H1N1)v virus were notified from China in this reporting period. A 2.5-year-old male from Hunan Province with illness onset on 30 June 2015 was detected through sentinel Severe Acute Respiratory Infection (SARI) surveillance. The patient was hospitalized with pneumonia and later recovered. He had no underlying medical conditions. The case investigation found that the case was exposed to pigs in his village. The second and third cases were a 5-year-old female and a 4-year-old female from different cities in Yunnan Province with illness onset on 17 November and 22 November 2015 respectively. The cases were detected through sentinel Influenzalike Illness (ILI) surveillance and both had mild symptoms. Exposure history for both cases is not known. To date, a total of seven laboratory-confirmed cases of human infection with this Asian sub-lineage A(H1N1)v virus have been detected in China. The haemagglutinin (HA) gene recovered from viruses detected in the most recent three cases grouped with swine influenza A(H1N1) viruses circulating in China. 1. What is the likelihood that additional human cases of infection with influenza A(H1N1)v viruses will occur? Influenza A(H1N1) viruses circulate in swine populations in many regions of the world. Depending on geographic location, the genetic characteristics of these viruses differ. Most human cases are exposed to the A(H1N1) virus through contact with infected swine or contaminated environments. Human infection tends to result in mild clinical illness. Since these viruses continue to be detected in swine populations, further human cases can be expected. 2. What is the likelihood of human-to-human transmission of influenza A(H1N1)v viruses? No case clusters have been reported. Current evidence suggests that these viruses have not acquired the ability of sustained transmission among humans, thus the likelihood is low. 3. What is the risk of international spread of influenza A(H1N1)v viruses by travellers? Should infected individuals from affected areas travel internationally, their infection may be detected in another country during travel or after arrival. If this were to occur, further community level spread is considered unlikely as these viruses have not acquired the ability to transmit easily among humans.